This Halloween was windy, cold and rainy. I thought Trick-or-Treat would be put off until tomorrow night. But 5 o’clock rolled around, and my church family had decided that they wouldn’t let the storm get in the way of welcoming children in costumes, and giving them lots of candy. I loved seeing the happy neighborhood kids come in with their costumes, and loved seeing my church family interact so lovingly with them like they do every year. I was really touched by the parent/child love I was witnessing as well. It would have been so easy for these parents to look out the window and tell their kids “no trick-or-treating this year”. 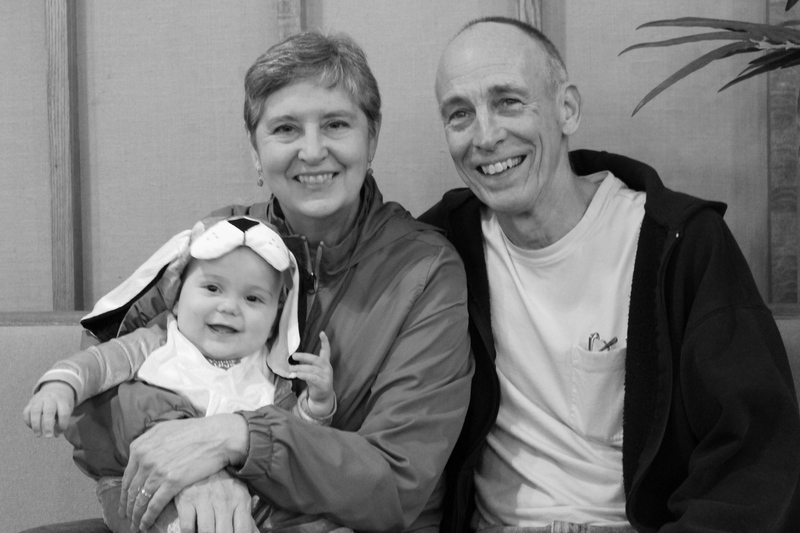 Instead, the church building lobby was full of children whose parents realize how special Trick-or-Treat is, and that a little water never hurt anyone. When I arrived with Daniel and Gideon, a father was rushing out of the building with a pumpkin seat on each arm, and quickly putting the babies in the car before they got wet. I made sure to let him know how great a dad he was for making Halloween memorable for his kids. I don’t know where you stand on the topic of Halloween. Whatever your stance, I respect it. 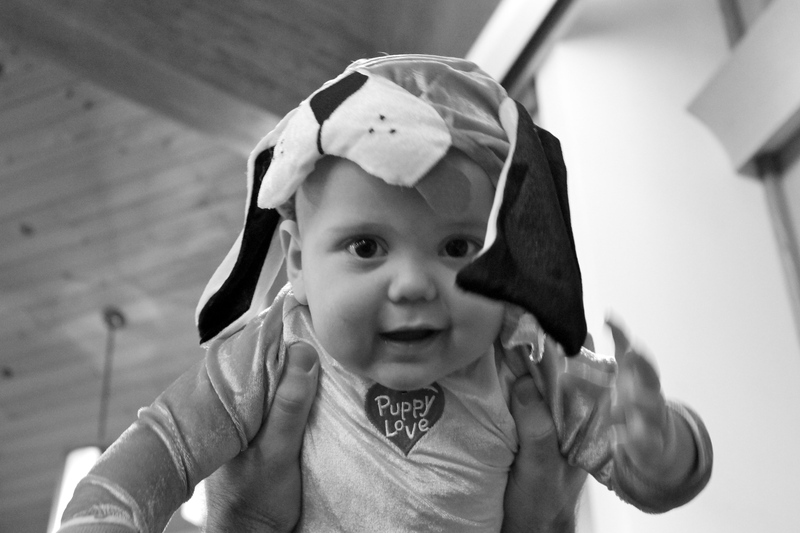 But I just wanted to document how special this Halloween was for me – not just because it’s Gideon’s first Halloween, but because I was reminded that if I pay attention, I can find love everywhere. My heart goes out to all the children who don’t have parents who care about them. I know there are kids who put something together by themselves, and went trick or treating alone. I pray God put nice people in their path to make them feel special. Poor Gideon spent his first Halloween coughing, sneezing, and wiping his runny nose. I don’t let Gideon watch more than an hour of T.V. in a day total. But today was different. It was rainy and cold, and watching T.V. is one of the only good things about being sick, right? Gideon making the best of being sick. He ran a little temp this afternoon (100.4), but by late afternoon Gideon was his usual ball-of-energy self. We put him in his costume and got on Skype so my parents could see him. Then we put Gideon in the car and let him nap while we ate our take-out and visited for a while. We get our precious time to talk and catch up where we can. There were no decorated trunks for Trunk-or-Treat this year, but I didn’t hear any complaints. Everyone had a blast. Gideon and all his friends. We have a cowgirl, Yoshi, an owl, a unicorn, a chicken, and even Harry Potter was there. We are so honored. I searched high and low for costumes. I kept coming back to the puppy outfit. He is, after all, “my puppy”. What did you and your family do for Halloween? Gideon is 7 Months Old! I’m a week late getting this on my blog. Gideon is actually 7 months and 1 week old today. Every month with Gideon gets better and more fun. He is such a delightful baby, and it’s a pleasure to take care of him. He’s so big and strong, and so very intelligent. I love seeing Gideon’s personality evolve and develop more every day. He is determined, sweet, expressive, and excited to learn. Gideon is also very cuddly which makes me very happy. September was full of fun, family, new foods, sippy cups (he’s getting better at it), and making new associations and connections with the world around him. The two signs that he seems to understand pretty consistently are the signs for “milk” or “leche” and “all done”. We are now introducing “diaper” or “pañal”, “drink”, “eat”, and “more” or “más”. Object permanence has set in pretty good, and turn taking is all the rage right now. Gideon is so much fun to play with. Did I mention he’s so smart? I noticed he was starting to get bored with his “baby toys”. One Toys R Us run later, and I can just see how interested Gideon is in learning how to make them work. Gideon is a solid sitter now, and is serious about moving forward when he’s belly down on the floor. He can now put his knees underneath him, and does a great downward dog. He’ll be crawling in no time. I can’t wait! 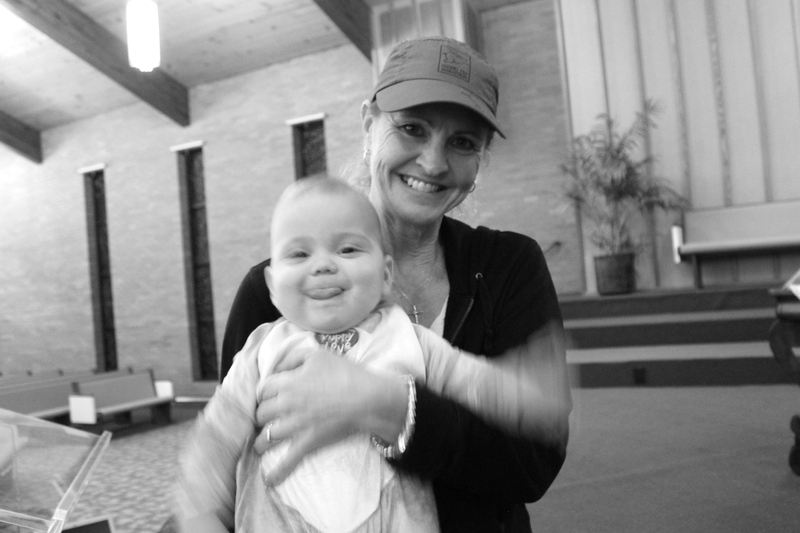 Enjoy this video and these pictures of Gideon’s first September. featuring “Little Liza Jane” by Elizabeth Mitchell. One of Gideon’s favorite songs at the moment. 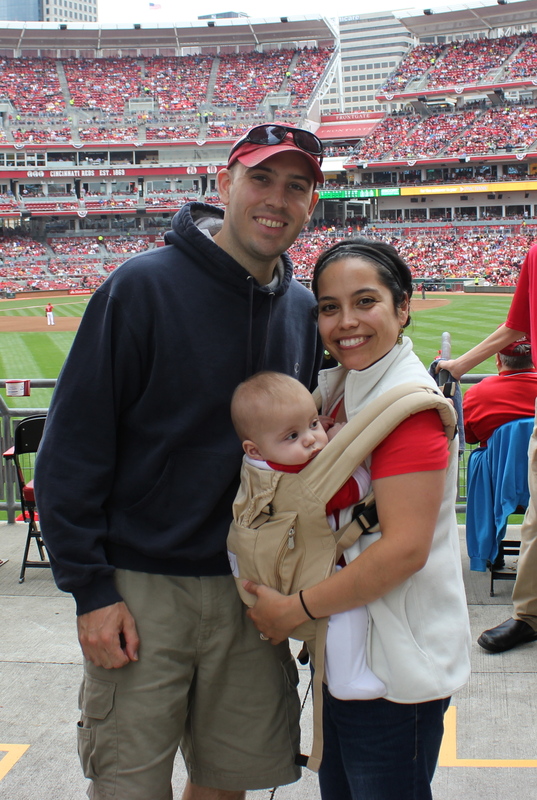 Our little family of 3 at Gideon’s first Reds game on September 29th. The first of many baseball games! We had to leave early because it started to rain, but Gideon was such a good sport. Didn’t complain once. We went to the zoo with Gideon’s grandma and cousin. We got to see the cheetah run for the first time. It was awesome. Gideon hanging out with some great guys. Do you have any advice on teaching baby sign? I’m open to it! At 1 A.M. last night Gideon woke up crying inconsolably. I tried to feed him, but he was not interested. He went back to sleep and repeated the same pattern twice before the thought came to me that maybe Gideon was not hungry. I’m slow, I know. He did not want to be held, he did not want to be in his crib. Gideon did not know what on earth he wanted, all he could express was that he was not content. The poor little guy was so sleepy, and could not be comforted. Finally, in a desperate attempt to calm him down I got him out of his crib for a snuggle in the rocking chair. As soon as I lifted him, I knew it. His body was radiating dry heat and his little head was hot against my cheek. Gideon was also limp with exhaustion from lack of sleep, and just wanted to lay his head on my shoulder and pass out. He had a little fever of 100.9. Nothing to call the doctor about, but I just felt so guilty for not noticing sooner. I decided to let his smart little body do its job, and at about 4 A.M. I chucked all the sleep training no-no’s out the window, and brought my sweet little baby to bed with me. Gideon instantly relaxed, loosened his grip on the pacifier letting it dangle from his lips, and collapsed into a deep sleep. I just lay there staring at him. We both slept peacefully until 8 A.M.
All he wanted was to be in bed with me. I’ll be the first to admit that as a new – oftentimes insecure – mother, and in an attempt to do what’s best for Gideon, I’ve ended up following some theory or belief to the T only to discover over and over that my instinctual reactions to Gideon’s cries or behaviors will not quiet down. Even if a desired action or behavior is achieved through some approach, I still only feel successful or like I’ve done my motherly duty if I do what feels right over what the experts tell me to do. In most aspects of life “it just felt right” would be considered pretty insubstantial proof that whatever you said or did was indeed right. And of all things to justify, parenting and child rearing are two things that you’d think would require practices that are evidence-based or backed by some pretty meaty quantitative research. But God made the parent-child connection to be a relationship where patterns and statistics cannot apply. It has taken me almost 7 months of loving Gideon and feeling connected to him in a way that I can’t describe, to realize that we really need each other. He needs me to be there for him, and to teach him that his cries and needs matter. I need him to know that they do. So take what you read, what you’re told, whatever methods you decide to stand for, and see them for what they are: things that there are a time and place for, interesting, at times groundbreaking and useful when you’re at your wits end … but more often than not, completely irrelevant. Because nothing and no one can read or interpret your baby like you can. And your baby can’t be comforted by anything or anyone like you do. Here’s to your mad innate parenting skills! Dry spell? I should say so! I have been a busy, busy bee. September was such a great month. It brought with it rekindled friendships, beautiful weather that demanded our company and enjoyment, and lots of life lessons. Being a stay at home mother can be very isolating. So September was a month when I really challenged myself to relax, and welcome the people around me into my world. Now it’s time to do some self-evaluating and see how I did on meeting those September goals I set for myself. Let’s begin, shall we? Personal Goal #1 “Take better care of myself”. I am flossing now, and have turned my evening walks with Gideon into an opportunity to break a sweat. And that is the extent of my accomplishments in this area. Womp womp. Personal Goal #2 “Read more. Fiction and non.” Goal NOT met. Hours upon hours of reading and researching every single aspect of what involves Gideon’s life does not count. This goal was meant specifically for leisure reading, and I’ve done none of that. Personal Goal #3 “Be a forward thinker. Plan ahead.” Goal met! Every week I have set one day as my “errand day”, and it has been great. A habit I will continue to practice. Family Goal #1 “Spend more time outside.” Goal met beyond my expectations. Family Goal #2 “Have people over more often.” Goal met. Household Goal #1 “Complete Gideon’s Binder”. Fail! I end up tossing everything I want to keep in a hanging file labeled “peanut”, and that is the extent of my progress on his binder. Household Goal #2 “Make my C.H.O. Binder”. Goal not met. I’m still in the planning phase of this project. Just when I think I’m ready to get it started, I think of something I want to add or change. I do, however, have a newfound love for my dry erase board. Keeps my mind focused and my days productive. It has been a good substitute for what my binder will [someday] be. Household Goal #3 “Establish a flexible-but-guideline-like routine for our day.” Goal met. Inasmuch as I haven’t met a bunch of the goals I set for myself, I have actually felt pretty productive this month. I have found my groove in maintaining the general state (cleanliness, neatness, basic going ons) of my home. How do I do it? By keeping it real. No more exhaustive daily to-do lists. It does me no good to constantly feel like I’m falling short. To-do lists are supposed to help, motivate, and reward you. If you don’t get any of these satisfactions from yours, then you need to re-evaluate. “What on earth does this list expect of me?? It’s fired!”. Try out different ones until you find the kind of list that makes you feel good about how hard you work. In total, I met 50% of my goals – which is a higher percentage than I anticipated. But September is in the past, and October is ahead. 1. Take better Care Of Myself Part II. Let’s try this again. 2. Try the no ‘poo hair washing technique. In the quest to simplify our lives, I’m striving to cut any costs that are unnecessary. The expense of haircare products is one area I’d be happy to eliminate from my life. I have yet to find a shampoo or conditioner that helps my hair in the long-term. The “good” brands are pricey, and eventually stop working. Besides, women have not always used detergent in their hair. I’m positive women in our ancestry did not use Herbal Essences or Aussie, and I get the sense that their hair was lush – so full of life, body and shine. I seriously suspect that if we let what God gave us take the reigns and let the hair He put on our heads thrive without our human-made additives, it would flourish. At any rate, I’m going to see what my hair does on its own. I’ll let you know how it goes! 1. Continue to make family dinner a priority. We have recently begun putting Gideon in his high chair to eat with us at dinner time, and it has been so good for us. We don’t answer phones, no T.V., just sitting, eating and enjoying each other. 2. I asked for Daniel’s input in this area and he had a great idea. He said that he enjoys how structured and schedule-oriented we are, and that he would like for us to maintain that about our lifestyle. But in addition to that, he would like for us to make daily Bible reading a family thing. We don’t now how this will look yet, it will probably evolve. But whether we read Gideon a Bible story, or we read our Bibles while Gideon plays with his books, we are going to make family Bible reading a priority. 1. I really like this maintenance groove that I’m in. The downstairs is pretty much set, I’ve got my routine down, and I’ve got a consistent handle on it. I’ve been hitting the upstairs this past week, and the rooms next on my list are Daniel and my closets. If I get to my office, that will just be icing on the cake. 2. Since going grain free, our pantry has changed a lot. It lost about 2/3 of its contents, and it needs a do over. Have you set any goals for yourself this month? Care to share?